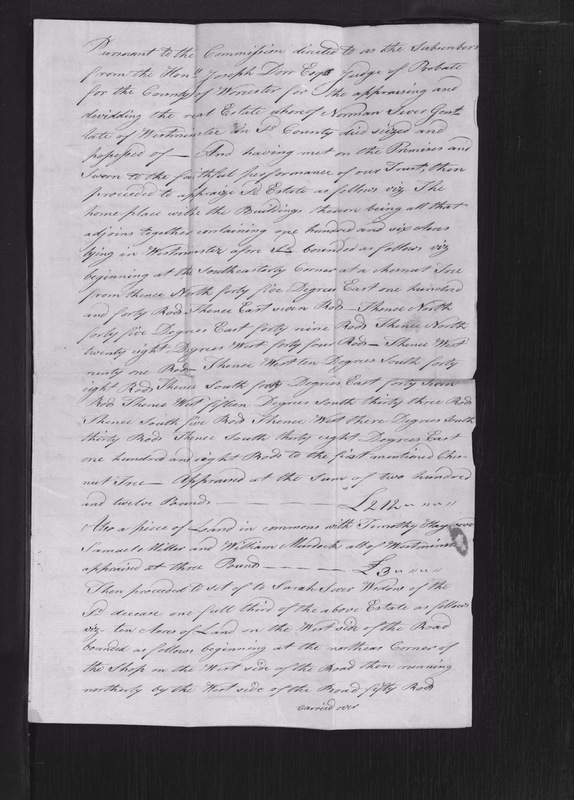 Genea-Musings: Amanuensis Monday - Post #305: 1792 Appraisal and Division of Estate of Norman Sever (1734-1787) of Westminster, Mass. Amanuensis Monday - Post #305: 1792 Appraisal and Division of Estate of Norman Sever (1734-1787) of Westminster, Mass. 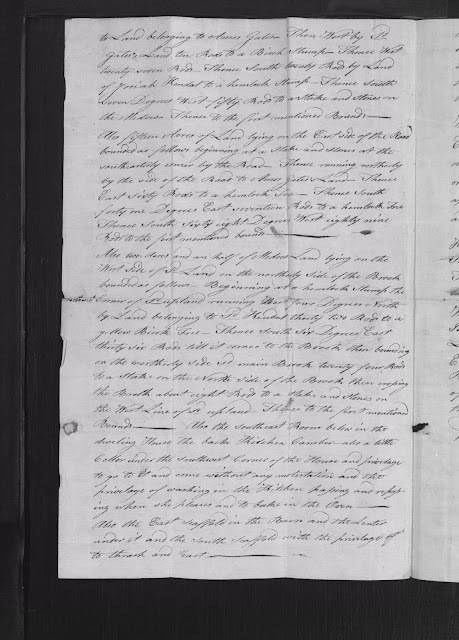 The subject today is the 1791 Appraisal and Division of the Estate of Norman Sever (1734-1787) of Westminster, Worcester County, Massachusetts. lying in Westminster afore s'd bounded as follows viz. and twelve Pounds £ 212 ~ .. ~ ..
appraised at three Pounds £ 3 ~ .. ~ ..
the Medow Thence to the first mentioned Bounds. Rods to the first mentioned bounds. ing when she pleases and to bake in the Oven. their equal share of the afore s'd £ 121 ~ 5 ~ 8. Lucenden Seavers having given my Aprobation. of Westminster deceased and I order the same to be recorded. Court of Probate this Third Day of January AD 1792. By order of the Hon Judge Joseph Wheeler Reg'r. Worcester County, Massachusetts, Probate case files, Case file 52,914 Norman Sever, 1787, Estate appraisal and division (pages 21-24 of 25 pages); "Worcester County, MA: Probate File Papers, 1731-1881," digital images, New England Historic Genealogical Society, American Ancestors (http://www.AmericanAncestors.org: accessed 2 January 2016); citing original records from Worcester County (Mass.) Probate Court. 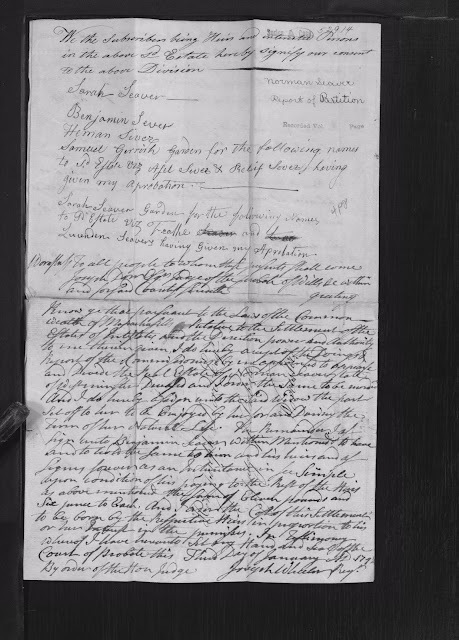 Norman and Sarah (Read) Sever are my 5th great-grandparents. They married in 1755, and moved to Westminster in about 1773. They had 13 children, 12 of whom are named in the division. 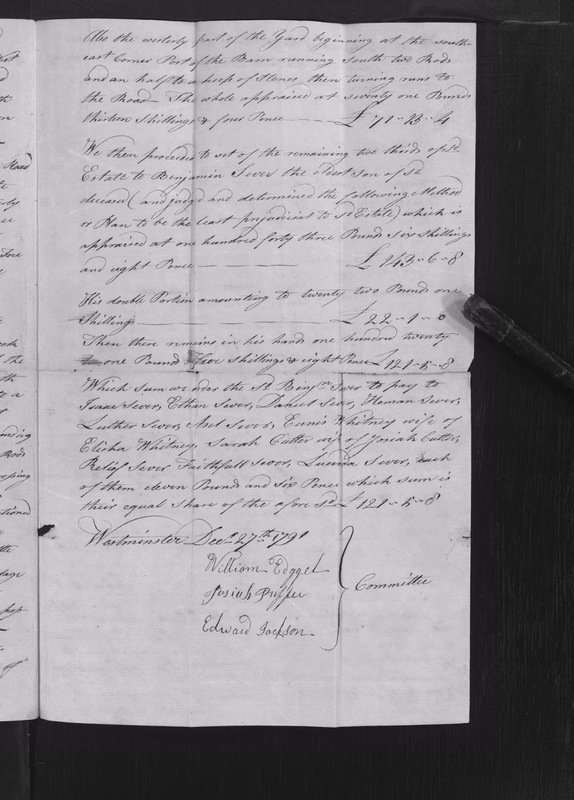 I am descended from their eldest son, Benjamin Sever (1757-1816), who received two thirds of the real estate in the division, but had to pay his 11 living siblings 11 pounds as their share of the estate.